Although it’s a busy time of year, the holiday season is a great time to launch a home business. People are in the buying mood. Further, they’re busy and need help. As a result, there are many opportunities to make extra money or launch a full-scale home business during the holiday season. The holidays are filled with cookie exchanges and the need for goodies at parties. If you can bake tasty treats, there are people willing to pay you for them. You’re not limited to selling your cookies to private individuals. You can check with local bakeries and restaurants who may need additional baked goods. 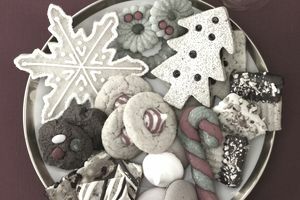 Also, contact businesses who may need baked goodies for office parties or as gifts to employees. You can learn more by checking out How to Start a Home Based Cookie Business. Families are already busy. Adding on the activities of the holidays is overwhelming. Some families could use help in the form of a holiday assistant who can help with the shopping, taking care of errands, baking, watching the kids, cleaning the house, wrapping gifts and more. Businesses also often can use extra help as staff takes time off during the holidays. You can offer temporary virtual support services to business to fill in the gap. These days, families and businesses spend a lot of time decorating for the holidays. You can help by offering to do it for them. If you have a good sense of style, you can decorate outdoors and indoors with lights, holiday plants, and other decorations. Check out these tips for starting a holiday decorating business. Parties are great fun, but a lot of work to pull off. If you’re organized, you can offer to help families and businesses have a festive holiday party. It can help to have a rolodex of other service providers you can work with, such as caterers, photographers and decorators. Read this overview of the party planner business to see if it’s a good fit for you. Do you enjoy cooking? Thanksgiving and Christmas are two of the biggest cooking days of the year, making them a great time to start your catering business. Along with creating holiday feasts, you can cater holiday parties for private families and/or businesses. You may be required to obtain additional licenses or permits for a food-based business in your home, but in many locations, this isn’t difficult or expensive. Read this article on starting a home-based catering business to learn more. The holidays are a busy time for traveling. If you’re not planning on going anywhere, you can offer to house and/or pet sit for neighbors who will be gone. If you stay in their home, it can be a mini-vacation for you. Or you can take care of several people’s homes/pets at the same time by checking in at each location once or twice a day. You can learn more by reading this article on pet sitting. Many people like to find unique gift ideas for their friends and family. If you’re crafty, you can sell your creations as holiday gifts. Many areas have holiday bizarre and craft shows where you can rent a booth. Or sell them online through Etsy or your own website. If you don’t make crafts, you can purchase items and put them together in gift baskets. Examples include bath baskets, coffee and/or chocolate baskets, and a gardening basket. These ideas offer an opportunity to jump start your business during the holidays, but also, they can continue into the New Year and beyond. Whether you operate a seasonal business, or intend to run it throughout the year, it's important to do your research and set your business up right so that you can make a profit. Further, you'll need to develop a holiday marketing plan to maximize sales during the season.